Content note: this article includes mentions of domestic violence. From a small basement kitchen in a Marylebone mansion block, a great racket is emanating. The air is filled with the scent of garlic hitting a hot pan, of vegetables becoming sweet and earthy in the oven, of chopped tomatoes reducing on the stove. On a rainy lunchtime, you can’t help but be drawn to this great hive of activity, where six women are chopping, stirring, sweating, and having a marvellous time. “Here,” one of them beckons as I watch them prepare lunch. “Have this to take away with you.” She hands me a jar of homemade chilli jam which she instructs me to slather on cheese on toast. You would be forgiven for presuming this to be the kitchen of a trendy new NW1 eatery. In fact, this is lunchtime at the Marylebone Project, the largest women’s hostel in the country. Upstairs, 116 bedrooms provide refuge for women who have escaped unimaginable hardship. Many have been victims of horrific domestic abuse, some are refugees who have become separated from their families, most have spent a period rough sleeping. The women come from diverse backgrounds, and their reasons for being here are complex. But in this kitchen, they find a common language. 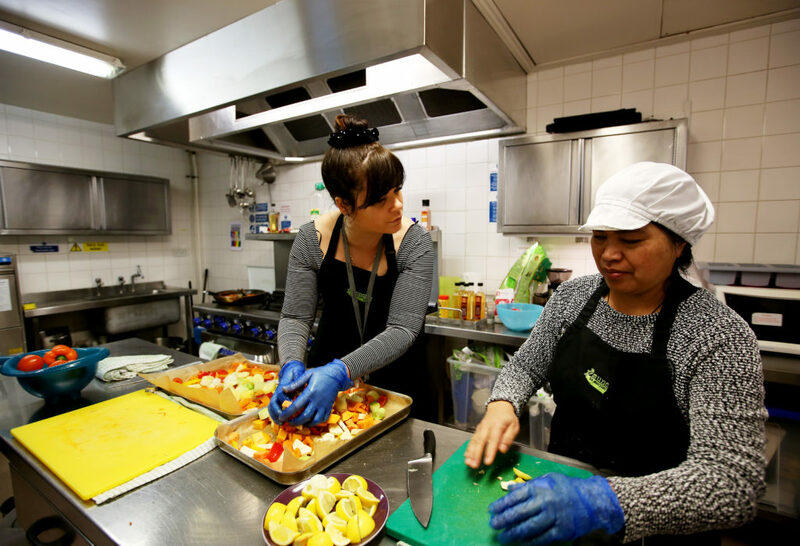 Every Friday, anyone who wants to can head down to the kitchen to help Leyla, the head chef, prepare a meal. 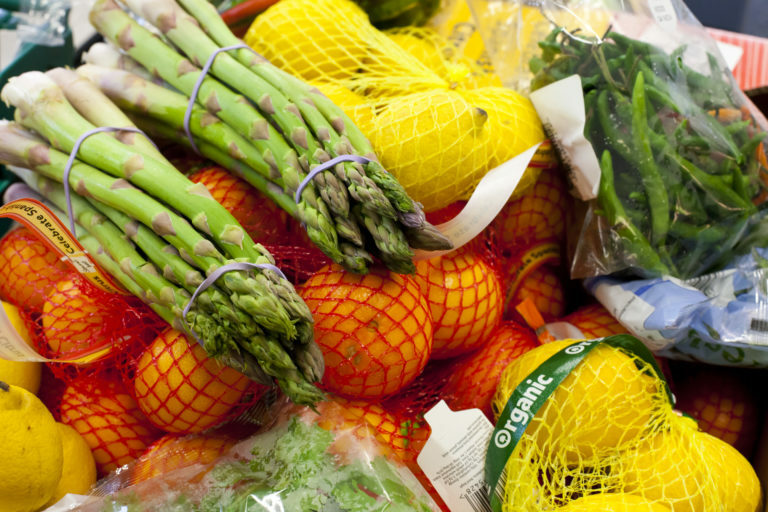 The ingredients are provided by one of the Telegraph’s three Christmas charities, FareShare, who deliver fresh fruit, vegetables, meat, dairy and bread every day. 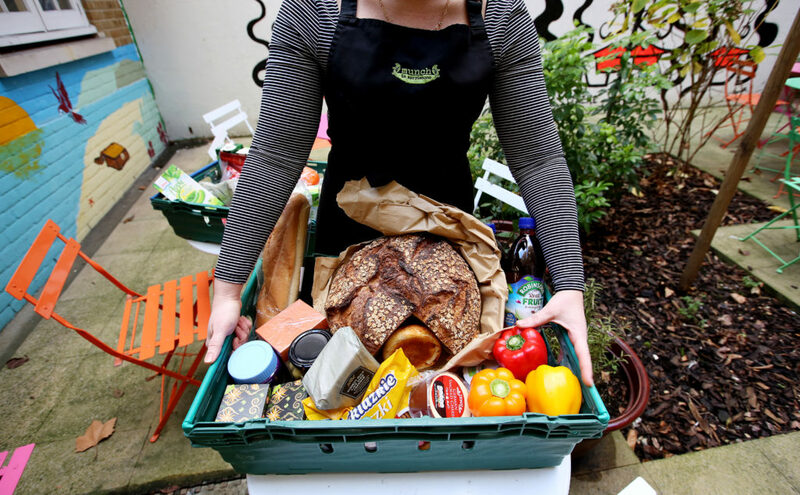 The Marylebone Project is just one of the 6723 charities and services FareShare delivers to every week, taking food which would otherwise go to landfill and bringing it to over 480,000 people in need around the country. 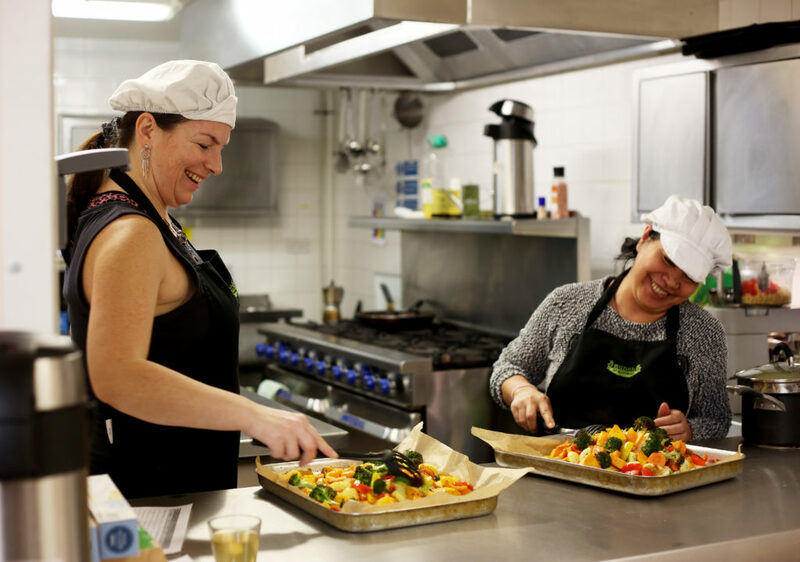 Here, the food provides an opportunity for a cooking class of sorts, but really it’s a chance for the women to talk (not necessarily about their troubles), to enjoy each other’s company, and to feel worthwhile. “I’m just allowed to be me here, there’s no pressure,” says Tanya, who lived at the hostel for a year after her flat was taken away from her. She won’t go into the details of everything she has been through, only to say that until she came here, she was in a bad way, living her life recklessly. Thanks to the help of people at the project, she has turned her life around. “I felt like a valuable human when I started coming here,” she tells me as she serves up a plate of root vegetables roasted with garlic and lemon. “The ladies are not under pressure here, they don’t need to tell us what’s going on in their lives,” says Leyla, who runs the weekly sessions, as well as a social enterprise which caters events for local businesses. Under her guidance, her band of women come together two or three times a week to make cakes, brunches and sandwiches for parties and conferences — most recently, they prepared 300 canapés to serve to bankers at BNP Paribas. “We try to give them professional skills they can put on their CV and feel a bit more confident and motivated about going into work,” says Leyla. Feli has cooked all her life, and did a food economics degree back home, but she is struggling to get a stable job here. Homeless women are irrefutably in more danger on the street than men. Research by Crisis, the homelessness charity, recently found 58 per cent of women sleeping rough had been intimidated or threatened with violence and force over the course of a year compared to 42 per cent of men. There are 68,000 women in temporary accommodation, emergency shelters or sleeping on the streets at the moment in the UK, and three in ten have experienced sexual violence at some point while homeless. Like many of the others, Feli comes to the Marylebone Project as often as she can, finding solace and a couple of hours of calm in working alongside Leyla in the kitchen. In a few weeks the ladies will cater the National Midwives Conference organised by the NHS. 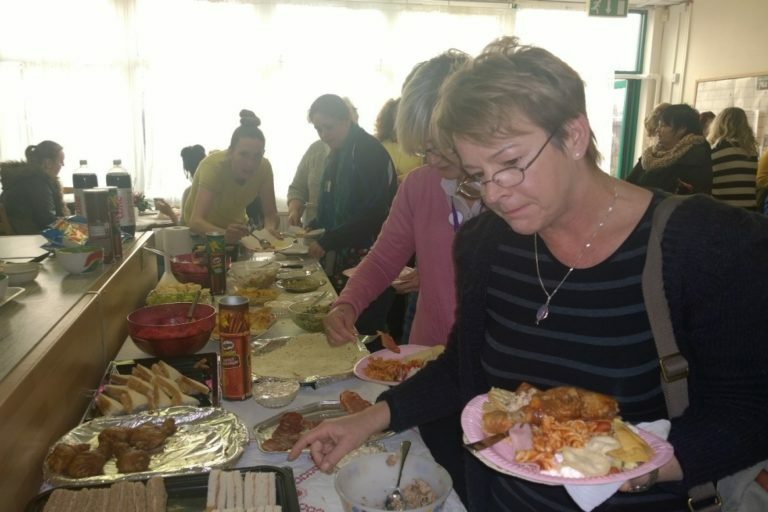 The money earned from these events goes straight back into the project, while the ladies who help out earn time credits — all part of a scheme set up by Westminster Council which allows people to do voluntary work in exchange for vouchers to spend on an activity they wouldn’t otherwise be able to afford, like a cinema trip. And for those women who want to pursue a job in the food industry, the project can help them earn a food hygiene certificate, and any other qualifications they might need. But they all say it is the cooking itself which has been utterly life-changing. One lady, who asked not to be named, has lived here for two years, and is getting help with alcoholism. Before she came here she was homeless for a period of time, but before that she had a stable job as a social worker and lived with her family — homelessness, she says, really can happen to anyone. Coming here and cooking again, she says, has given her hope. “I haven’t had a drink in 46 days,” she smiles. Lunch eaten and cleared away, the ladies get ready to go. One of them is heading upstairs to the room she has inhabited for two years, one to her own, brand-new flat, one is headed back out onto the streets — she doesn’t know where she’ll sleep tonight, but she’ll be ok, she tells me, she’s a survivor. The Marylebone Project is one of 224 charities and community groups across the capital which receive food from FareShare London. 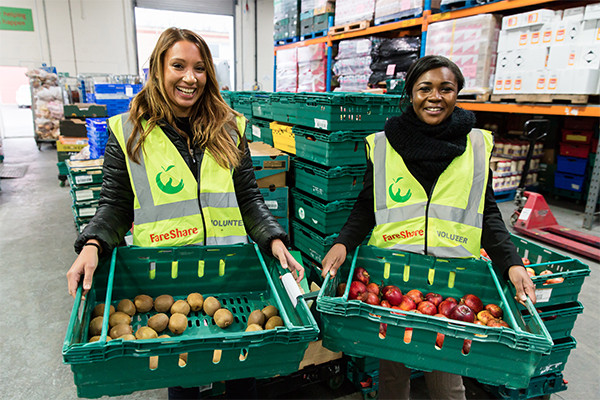 The FareShare London warehouse in Deptford is seeking volunteers who can spare time during the week to help ensure that good, surplus food gets to the people who need it most. If you’re interested in volunteering, tell us by filling in this form – your help will be greatly appreciated by lots of charities and community organisations like the Marylebone Project.